 There are 2 alerts for this track. Short walk to beautiful 80-metre falls behind Piha. Kitekite Falls • By Matthew. 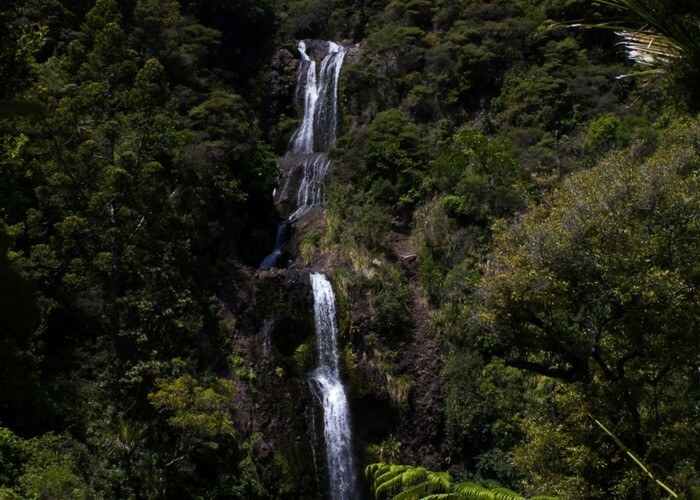 Licence: C.
The Kitekite Falls are a highlight of the Waitakere Ranges. There are several tracks in the area that combine to provide access. The park entrance at Glenesk Road provides a picnic area, water, information, and accessible toilets. Take the Kitekite Track past a large kauri stump and into nikau palm forest. Watch for the Knutzen Track sign off to the right, and take that to the fall. It is smooth walking all the way with some steps at the end. The falls drop in several steps to a pretty pool. This is a popular local swimming spot. You can even swim up behind the falls themselves. From here, it is easiest to return the same way. Alternatively, cross the foot of the falls and take the narrow track to a junction with the Connect Track. The Kitekite Track drops down a set of wooden stairs, crosses the stream and returns to the Knutzen Track junction. On the way out, cross the bridge to take Byers Walk down the other side of the stream. This track leads under palm trees, past tangles of supplejack, with a very large rata along the way. A clearing near the car park indicates an old mill site. A milling camp and kauri dam were once located above the falls, with logs being tipped over the falls on the way out. The Connect Track provides access to the dam site at the top of the falls. Added 28 December 2015 by MatthewMatthew. 1 revision 28 December 2015 by MatthewMatthew. 149 views in the past year (12 per month).